I’ve never understood the children’s game, “Duck, Duck, Goose!”…..and, if pressed, probably can’t remember the rules, object, or anything else about it. Good thing it has noting to do with this post. Which reminds me, I don’t get the whole “I’m On A Boat” thing. I do, finally, understand “The Cake is a Lie”…maybe I just need to ask Uncle Google about the boat. Good thing it’s not important to the subject at hand as I’m too lazy to do any research. I'm a Duck on a Boat...sort of...I'm actually on the lift that holds up the boat...that my famous twin, who sells insurance, owns but won't let me ride. I haz a sad. The look of disdain is because we ran out of quackers…hahahahaha…”quackers”..get it? 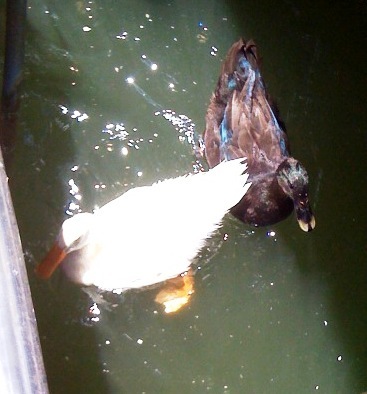 Hi, I'm Black Duck and I follow White Duck...EVERYWHERE! They were waiting for us at the dock when we decided that it was time to get off the lake, because the temperature at 11:00 a.m. was somewhere around 147 degrees, and I was beginning to turn bright red in spite of wearing SPF 50. We fed them all the crackers we had, hubby even getting White Duck to take a cracker from his hand…something I totally missed on camera despite repeated attempts. The closest I came was a blur of feathers and water at the end of hubby’s empty hand. As a photographer, I’m a pretty good duck feeder. After all the food was gone the ducks swam around the slip for a while, complaining. It wasn’t until we were back to the parking lot when I realized something. 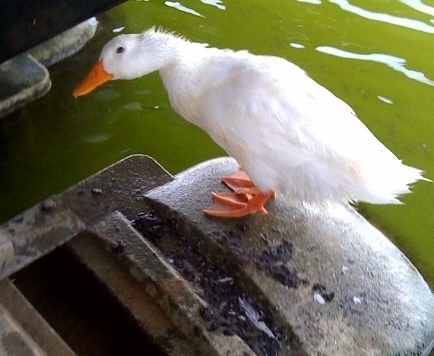 Angry ducks+uncovered boat=a whole lotta duck poop to be cleaned. Wonder if I can feign some illness this weekend so hubby can go out alone and spend the first thirty minutes of the day cursing me and the ducks.